Inspectis provides you cutting edge Digital Microscopes for optical inspection, quality control and metrology software. Explore our articles on optical inspection applications, geometrical measurements, imaging systems and illumination. Accuracy of geometrical on-screen measurement performed by Inspectis Software depends mainly on following parameters. Magnification. The higher magnification is, the more accurate measurement results can be. Higher magnification, however means less Field of View, why you have to select highest possible magnification (or zoom factor) which provides required Field of View. Image Distortion. Distortionis a deviation from rectilinear projection. Straight lines of an object don´t remain straight in a distorted image, why measurement accuracy of the object will be affected. Distortion must be controlled in optical systems used for performing geometrical measurements. Calibration. Accuracy of Calibration procedure you perform in software as well as accuracy of the Calibration Scale you use is directly reflected in the accuracy of your Measurements. A digital picture is a matrix of Pixels (i. e. 1920×1080 pixels if Full HD) with a certain Pixel size. When you calibrate a Magnification in Inspectis, the software calculates Pixel-to-Millimeter ratio for that specific Magnification. This ratio is then used for translating the number of Pixels to Millimeter or Micrometer when you perform geometrical measurements. You can see Pixel-to-Millimeter ratio on status bar of Inspectis user interface displayed as “Calibrated Pixel Size”. Image quality, Resolution Power. Higher resolution power, means larger number of image sensor pixels but also ability of the optical system (lens) to resolve detail in the object that is being imaged on image sensor. If two points that are close to each other are resolved by optical system and imaged on more than two adjacent pixels, you can measure distance between those points with a accuracy of one (1) pixel. Image Focus. A sharp picture is required for performing accurate geometrical measurements. Sharp edge of an object which is not in focus is imaged as a blurred edge on more pixels. This is equivalent to having lower Resolution Power. 1. 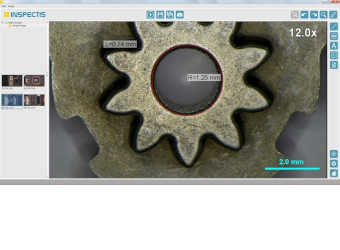 Verify which Magnification (or Field of View) is needed for your specific application. Use highest possible Magnification (or smallest possible FoV) for your application. 2. Use optics and magnifications with minimum lens distortion. 3. Use an accurate Micrometer Scale for calibration of the magnification in your software. If your Micrometer Scale has error, that error will be reflected in calibration and therefore affect your measurement accuracy. 4. Do the Calibration with utmost care! Make sure image of calibration scale is on focus. Put ends of the calibration lines exactly and accurately on scales. Any calibration inaccuracy will be directly reflected to your measurements. 5. In software use digital zoom to magnify region of interest when performing measurements. 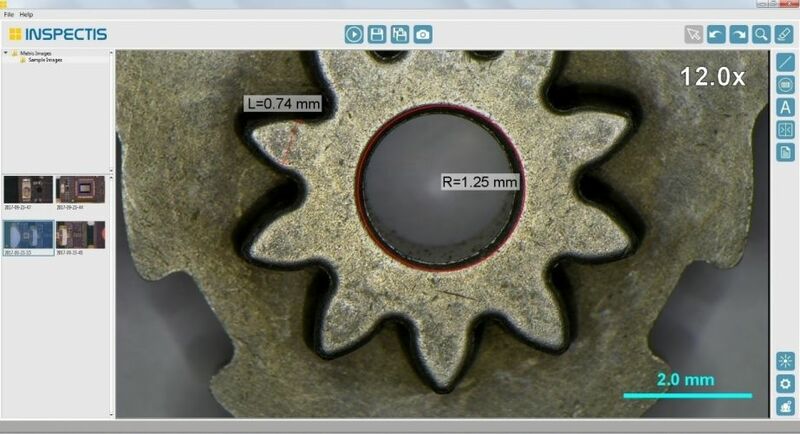 Digital zoom will help you to align measurement lines, curves or circles more accurately on the objects you are measuring with higher measurement accuracy as result. Contact us for the entire article in PDF. As circuits become more compact and components get smaller, inspection is more difficult and less certain, requiring more advanced inspection technology. 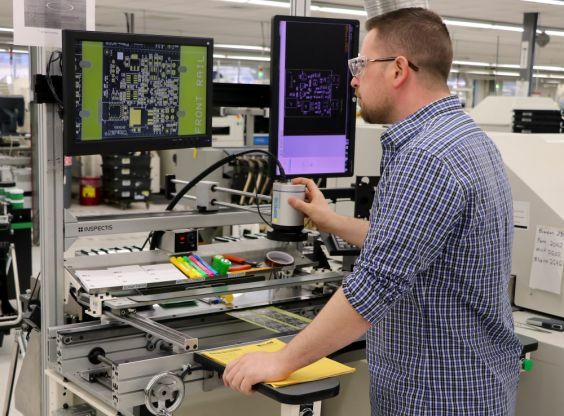 Whelen Engineering Company, Inc., an OEM with SMT and PCB assembly plants inChester, Connecticut, and Charlestown, New Hampshire, encountered this challenge. The solution came with the purchase and installation of several INSPECTIS AB HD video camera systems. The outcome was better inspection, as anticipated, but also a 50 percent decrease in inspection time an unexpected benefit. Whelen Engineering began in a garage in 1952, when George Whelen III invented the first rotating aviation beacon. As a privately owned company, Whelen has experienced growth for more than six decades. The development of that first aviation light helped launch Whelen into the automotive safety lighting industry as well. Whelen currently provides safety lighting for police, firefighters, emergency medical services, and departments of transportation, as well as many other industries. The production volumes in the automotive sector have allowed Whelen to invest in the latest automated assembly equipment in order to compete worldwide. Last year, Whelen purchased more than 44 million LEDs for use in its extensive family of products. Jim Blundon, SMT electronic production manager, oversees production in the larger and newer Charlestown facility. “We have five SMT production lines and 1,000 employees in our New Hampshire facility, building primarily automotive products. We are considered an OEM supplier and currently build approximately four million PCBs per year,” says Blundon. 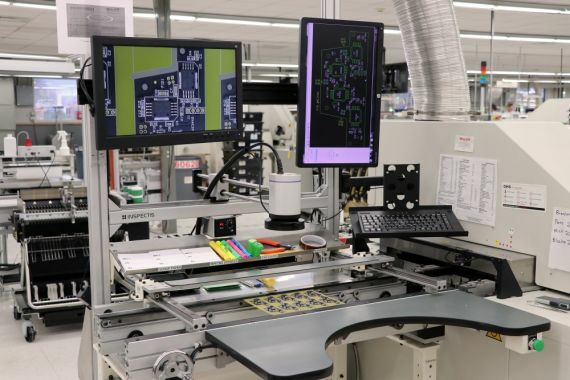 The company assembles surface mount and through-hole circuit boards and tests them in-circuit. “Our goal is to bring innovative, life-saving products to market more quickly, while maintaining strict quality control throughout the process,” he says. “We have accomplished this through a vertical manufacturing initiative to eliminate or reduce outsourcing, expanding the use of robotics and implementing state-of-the-art production equipment. Perhaps most importantly, we have a motivated workforce of more than 1,500 employees.” Between its two manufacturing facilities, Whelen has a total of 800,000 ft2 (74,322m2) of space. components and correct polarity, orientation, position, and placement accuracy, before the soldering process. The boards undergo AOI after soldering. In fact, this was nearly an impossible task with the magnifiers. There were four etched characters on the top of each component that needed to be read for verification, plus the polarity. The company needed a better way to inspect the components, including higher magnification, as well as improved image quality and lighting. After looking carefully at a number of different prospective suppliers, Whelen’s engineers settled on the INSPECTIS F30s with ring light and x/y rail system. The team liked the simplicity of the unit. It was easy for operators to learn to use and had few buttons. “We really liked that it could be mounted inline, rather than having to use it at a separate offline station,” says Blundon. “We were inspecting the parts right as they moved through the line, and we didn’t have to offload or disturb them.” The x/y stand made maneuvering the system easy. The new inspection system was a huge leap forward from the handheld approach that the company had been taking. The INSPECTIS F30s brings exceptional capabilities and advantages to digital microscopy for SMT electronics assembly, including full HD, 1080p 60 FPS HDMI output, 30:1 zoom optics with autofocus, and a generous practical working distance. Objects under inspection are rendered sharp, clear and large. Its 56x screen magnification on a 24 in. (61 cm) monitor, for example, can be increased up to 200x with auxiliary lenses. While the digital camera system is designed for performance even in poor light, the F30s units at Whelen are equipped with the HD-024-B ring light, providing powerful adjustable illumination. This light incorporates eight highpower white LED lamps for various incident light applications, offering homogenous, daylight-white lighting. Accessories include an attachable polarizer/ analyzer filter set for removing glare and a diffuser filter for extra smooth and soft illumination. The initial trials and subsequent incorporation into the production line worked so well that rather than just inspecting critical areas and certain components, the camera system is now used to inspect the entire PCB. This is due in part to the system’s large field of view (FOV). “It’s easier to use and details are much easier to discern, such as the laser etchings on a number of parts, due to the power illumination attributes of the system’s ring light. For these very tiny parts and minuscule details, adequate, controllable lighting is very important. We didn’t have that before,” says Blundon. 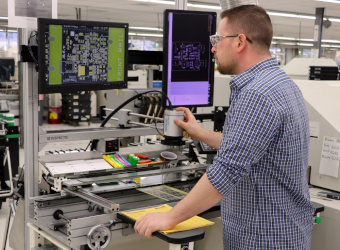 The Chester, Connecticut, facility is a different manufacturing environment, according to Eric Soderberg, electrical manufacturing engineer. Soderberg has three INSPECTIS machines, three manufacturing lines, and very different requirements than those of the Charlestown factory. That could potentially make any production station a bottleneck, but Whelen’s engineers saw an opportunity where inspection could have been one. Soderberg and Blundon shared similar impressions of the INSPECTIS. At the inline INSPECTIS station, two side-by-side monitors are used. The one on the left shows the live INSPECTIS image, and the one on the right displays an assembly print image. “In Jim’s facility, he’s got one big flatscreen monitor that he flips between the INSPECTIS image and the assembly print,” says Soderberg. “The problem is that we panelize, so the monitor on the right has to match up to the image on the board. We call out the fixed rail edge, which stands out on the front rail with the operator, and images within the array don’t always line up with the picture that our system gives us of the prints. What I always stress to the operators is that we’ve set up the monitor on the right to be able to rotated left or right to match up to what they see on the board, sometimes vertically, sometimes horizontally. On top of that, the tiny components, LEDs, are difficult to see. Using handheld magnifiers to compare images on the left with those on the right wasn’t effective, without the degree of clarity provided by the INSPECTIS. Soderberg notes that the camera system has helped to speed up his facility’s pre-inspection process by about 50 percent, as well as adding better lighting and imagery, along with a wider FOV.